First of all our congratulations to JR and Mei Suartin who celebrated their 1st Year Wedding Anniversary last month. They are now extending their celebration and the good graces they had received during the year with all of us. JR and Mei will be giving away a cool silk and cotton bag from Thailand for free. All you have to do to qualify to the draw is share the link of Asyanna (http://asyanna.com/) and Mei's personal blog (http://meilbox.asyanna.com) through an email to at least 50 of your contacts and buy a minimum purchase of P300.00 from their personal care products line (under the Human Heart Nature label). The single purchase requirement can be made by you or any one of your contacts. Just as long as you or anyone of your contact bought P300.00 worth of products (within the promo period), then you can already get the chance to be picked up as the winner of this bag. ASYAnna will then compile the names of those who have done these two requirements within July 4 to August 4, 2010. After that, the lucky winner will be drawn 12 midnight of August 4. The best thing is ASYAnna might also decide to give consolation prizes of free personal care products so hurry, email the links now! 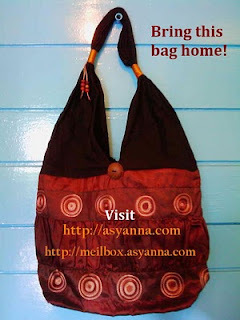 You may also be entitled to join Asyanna's raffle draw, "Bring Home a Bag Promo." Please visit the sites for more details (in Asyanna's site, just click "Blogs"). Thank you and happy browsing/shopping! Personally, congratulations once again JR and Mei! Thank you so much for the support, Mei and Dave! God bless!